If you know me well, you know that I'm a huge pork fan. I just love the lean meat and the mild flavor as it allows you a lot of freedom to make it meld with any dish. 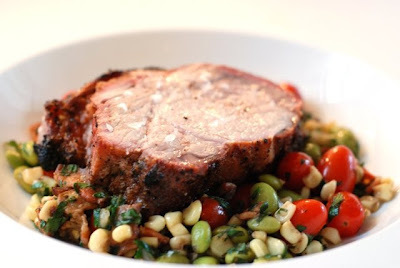 I made this particular recipe to go with my Summer Succotash and it was a perfect match with the fresh vegetables. I also used a bit of chunky finishing salt at the end to really bring out the flavor of the pork and add a bit of crunch. So the crystals on the bottom picture are not snow! I made this dish on my charcoal BBQ and used an indirect heat, slow cook method which was surprisingly easy, so make sure to give it a try! Remove any excess fat off the pork roast. Mix all spices to create dry rub. Drizzle just enough oil over the roast to coat and cover with dry rub, cover and let sit at room temperature for one hour. To create indirect heat on your grill, fill a chimney completely full of charcoal briquettes (do not use wood here it burns to hot and quickly). When charcoal is ready pour onto 1/2 of the grate and you are ready to BBQ. 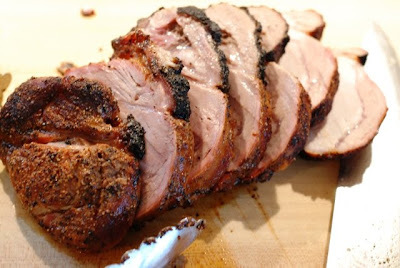 Place pork roast directly over coals and cook just a few minutes on each side to brown the outside and create a crust. Next move the pork roast to the side of the grill without any coals, cover with lid and let cook without moving until it reaches 145 degrees on an instant read thermometer, about 1 hour. Remove roast from grill and place on plate and tent with foil, let rest for 10 minutes (internal temperature will continue to increase to about 155 degrees). Cut roast into desired thickness, sprinkle with finishing salt, and serve. I am a huge pork fan too... this looks fantastic and perfectly cooked. Nicely done my friend. Mmmm, lovely! I have a pork loin in the freezer that's just begging me to try this. Thanks Pam, nice to hear from you! Looks great. I can't wait to get back to cooking once this heat wave is over! I think I'll have to try it! Out with the christmas turkey and in with the pork loin!